When Monica Bhide put out a challenge to make up a spicy cocktail, I grabbed the opportunity to play with some of my favorite ingredients. 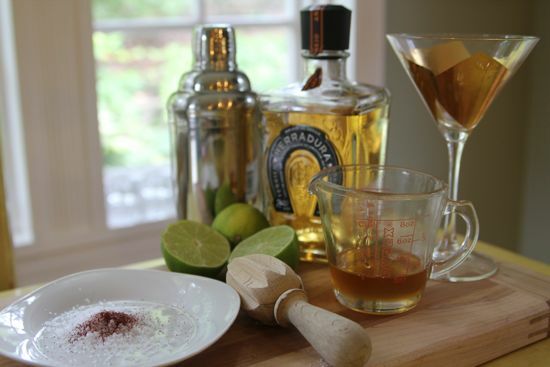 I love to make up cocktails, and always greet dinner party guests with a new concoction. It gets the party started. This concoction was inspired by one of my favorite new canning projects. Foodie with Family has a great blog, full of amazing recipes, and her Cowboy Candy has become an obsession. Rebecca warned me. She said I would join the forever club, and I’m ready to sign up. Once you’ve made the candied jalapenos, the leftover jalapeno syrup is awesome as a barbeque marinade. But something told me I could make something similar for a cocktail. Welcome the Jalapeno Margarita. Flavored with a sweet, tart, spicy syrup, made with half cider vinegar and half sugar, I’m bringing the spirit of the Shrub to this cocktail. 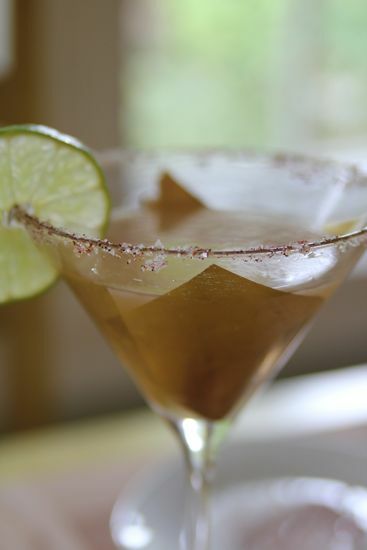 There’s a kick, sure, but it’s the Ancho Chili Powder salt rim on the glass that really makes this drink zippy. For a non-alcoholic version, just blend three tablespoons of the spicy syrup in a tall glass filled with ice, topping with sparkling water. Garnish with a lime quarter dipped in the salty, chili rub. 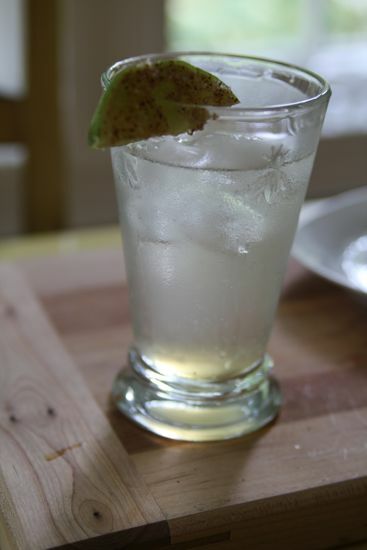 To enjoy, squeeze the lime and drop it in the drink. Ahhhh. So refreshing! Cheers, Monica! Thanks for the fun, and the inspiration. Now I have a new cocktail to kick off the weekend. *Make ahead – recipe follows. 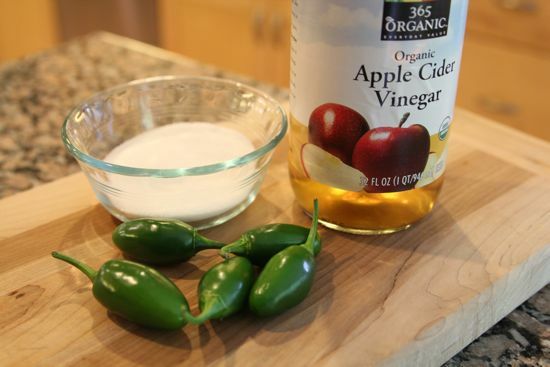 Put the vinegar, sugar and jalapenos into a small saucepan. Bring to a boil and boil hard for five minutes. Allow to steep for 20 minutes, then strain and chill the syrup. Get out two fantastic martini glasses. Something elegant and worthy. Mix together the chili powder and the salt. With the cut side of a lime, moisten the rim of the glasses. 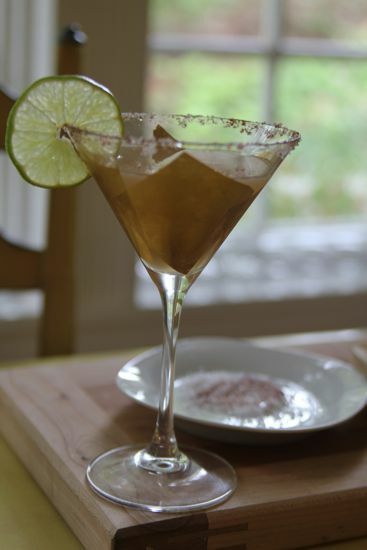 Dip them into the salt mixture to create a generous salt rim. Pop the glasses in the refrigerator to chill while you make the drink. Energetically shake the tequila, syrup and lime juice in a cocktail shaker filled with ice. Strain and divide between the two chilled glasses. Garnish with a big wheel of lime. So retro. Look each other in the eyes and make a toast. Cathy: I can’t believe it! I was canning some jalapenos tonight (Jalapeno Rings with Honey from “Joy of Pickling”, hoping for a sweet pickle like I had bought at the farmers’ market. It wasn’t as sweet as I had hoped, but I processed them anyway. Then I logged on to your blog to get the recipe for Spicy Plum Sauce when there was your post and a link to Candied Jalapenos! This is it, the exact ingredients on the jar I bought at the market! Thank you so much, I was just about to search for a better recipe. I love your blog, and the second batch of Spicy Plum Sauce is cooking on the stove. Sounds right up my ‘I love margaritas’ alley; will have to try! Also right up my new feature alley…I’ve started a Happy Hour Friday on my blog and I’ll do a drink or appetizer every week. Want to come add yours? This week there is even a chance to win a prize! Gorgeous photos and fabulous idea!! Ooo – our little jalapeno plant has a few left from the summer, dying to be tried in such a fashion. Great idea!